HIALEAH, FL�DECEMBER 16, 2012�Royal Vista Ranche's world champion stallion WAVE CARVER sired three finalist Sunday to the $209,440 Hialeah Laddie Futurity at Hialeah Park. The lightly raced Carverson won the third trial for owner Jose R. Herrera. Out of the Ronas Ryon mare Miss Razz Chic, Carverson was making his third career start for trainer Rogelio Martinez. Freddie Martinez rode the colt bred in Oklahoma by Pazazz Quarterhorses, Ltd.
Hez Snow Quick, a gelding out of Shez Snow Quick by This Snow Is Royal , qualified with the seventh fastest time for owner Dan Frazier. Matt Frazier conditions the gray gelding with Shanley Jackson riding. Hez Snow Quick has won two of seven starts this season, earning $17,882. Marcus Smith is the breeder. The final qualifying spot went to Bradley Hale, Wade Helton and Bill Moler's Dm Red Tide. Alfredo Gomez trains with Omar Reyes riding. 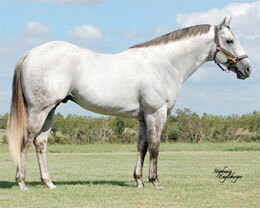 Don Moler bred the gray gelding in Oklahoma from the Sixarun mare Sashay N Six.